I chose Nepal Wilderness Trekking on the recommendation of a friend, and I could not have been happier. My trek along the Annapurna Trail was amazing. This trek has undoubtedly made me fall in love with the natural beauty of the Himalayas and the kindness of the Nepalese people. In the office, Himal and his team have been prompt and professional in their communications. Throughout the planning process, Himal helped me design an ideal itinerary to accommodate my schedule and trekking interests. His team was also extraordinarily helpful once I landed in Kathmandu. On the trail, my guide Lal provided an experienced and helpful insight into the natural beauty of the trek and the local communities we passed along the way. Be warned: Lal is also an excellent card player. Nepal Wilderness trekking took all of the stress out of my trip planning and provided a trek that can only be described as excellent. 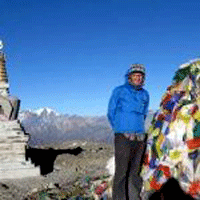 I certainly recommend using their services for any trekking in Nepal.